This place is Estelita’s Library, a new book haven/conversation hub housed inside The Wine Station on Beacon Hill (WA). (The space was formerly home to The Station coffee shop, which is now thriving in larger digs across the street, next to Roberto Maestas Plaza.) The tiny wine bar, open since October, already had a piano, a ceiling adorned with branches and birds nests (by Seattle artist Briar Bates) and a handful of tables. As of this weekend, it will boast newly installed bookshelves filled end to end. Sporting a beard, a woven-cedar hat and a Cuban guayabera shirt, Lindo is friendly and easygoing. He graduated from the University of Washington School of Law in 2012 and now teaches race and law classes there. He has no previous experience running a bookstore or working in a library. “I just love the idea of building community through knowledge,” he says. Calling his new venture a “justice focused community bookstore and library,” Lindo has amassed a wide range of books (from his own collection and from various library sales) about matters of social justice, race, class, politics and the history of oppressed peoples. “You’ll find books on Latinx identity next to a book about Harriet Tubman, next to Karl Marx, next to a first edition John Steinbeck,” he says, gesturing toward a packed shelf. Though some of the titles have Dewey Decimal stickers (“They’re really hard to remove!” he marvels), the books aren’t arranged in any particular order. Lindo hopes instead that people will make discoveries by proximity, or perhaps by suggestion from someone sitting at the next table. With a Nicaraguan father and El Salvadoran mother, Lindo identifies as Central American Indio. His partner Estell is Black. He wants their 8-month-old Afro-Latinx daughter, Estella, to be surrounded (and eventually, engaged) by books that reflect the experiences of people of color. “This is her library,” he says. Judging by the books, Estella is going to develop massive reading chops. A spin across the spines reveals The Autobiography of Malcolm X, The Shock Doctrine by Naomi Klein, Between the World and Me by Ta-Nehisi Coates and Fidel Castro’s La Historia Me Absolverá (History Will Absolve Me). 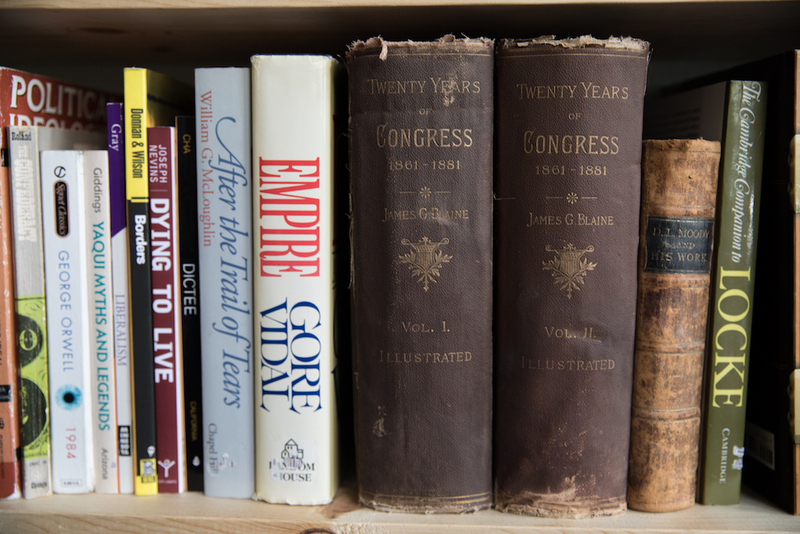 There are books about Sacajawea, feminist history, NAACP’s 100 Years in Pictures, Malcolm Gladwell’s Blink, Ralph Ellison’s Invisible Man, poems by Maya Angelou and a few surprises, including The Great Gatsby, a book by Glenn Beck and the Chicago Manual of Style. The money raised from memberships and food sales on Saturday will go toward another one of Lindo’s projects: archiving, digitizing and publicizing all 467 issues of the hard-to-find Black Panther newspapers. He currently owns 100 issues, and has a line on 300 more (see his GoFundMe page for details). He plans to showcase a few copies at the opening this weekend, and more in the future.